Family: Father Colin, Mother Janet, Sister Susan. Despite spending the vast majority of his racing career with Arena Essex, Troy Pratt always seemed destined to ride for Cradley at some point, but he took the longest possible time about it before finally joining the ranks, and when he eventually did become a Heathen, it couldn't have been a more difficult time. He started out as mascot of local track Rye House, but Dad Colin had been team manager at Dudley Wood for over four years when Troy made his own major breakthrough into speedway. After turning out for the Arena Essex junior side in 1988, he signed on the dotted line for the Hammers National League side the following year. After showing significant promise, his career was threatened when he sustained neck and back injuries in a crash in 1990. He returned after the injury in equally good form though and continued his progression through the ranks at Purfleet, soon becoming a heatleader and holding down his place under a new promotion in 1991. Troy moved into the top flight with the Hammers in '92 and within another twelve months found himself capped by England at international level on his home track. Unfortunately, 1994 brought an end to the steady improvement. An early summer injury and loss of form culminating in several months spent at reserve, eventually led to the club loaning him out for the 1995 season. Pratt started the year with Kings Lynn where he was to link up with on loan Heathen Morten Andersen, but the year was to be again wrecked by injury. During the winter of 1995/96, events would finally lead to Troy's spell with Cradley. 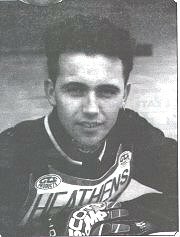 Jan O Pedersen took over as team manager, with Colin Pratt parting company to end his 11-year association with the Heathens. As one member of the family left, another came through the door. Pedersen and the club directors could not agree terms with Jonathan Forsgren or Scott Smith, and they were replaced with the signings of Pratt Jnr and Stuart Swales for the 1996 relocation to Stoke. Typically, it was another season littered with injuries for Troy. He crashed out of the second match missing the third meeting completely, and then suffered a back injury only a month later which would rule him out for another fortnight. In between, he had shown glimpses of impressive form with two 11 point hauls against Long Eaton and Swindon, and paid twelve away at Wolves. The rest of the season consisted of a couple more minor injuries, a couple more big scores and a few frustratingly inconsistent performances - highlighted even more by his early season partnership with the equally frustrating Dalle Anderson. Above all through the whole time, Troy was a popular figure in the pits and an integral part of the Heathens' renowned team spirit. When the club closed at the end of '96, Troy returned to Arena Essex as the Hammers returned to the second division in its inaugural year as the Premier League. Despite announcing and then withdrawing his decision to retire at the end of 1998, he has remained at the club, spending the majority of time as heatleader, and being rewarded in 2001 with a testimonial meeting.